Red Brick Lane Marketing Solutions Pvt Ltd, which runs media-tech startup ZAPR, has raised an undisclosed amount of funding led by Flipkart, with participation from Saavn and Micromax and Mu Sigma co-founders - Dhiraj Rajaram and Ambiga Dhiraj. This round also saw participation from existing investors Dinesh Agarwal, Samir Bangara, Sanjay Nath and Arihant Patni. The funds raised will be primarily used to expand the company's product portfolio for the media and advertising industry as well as to scale up the technology team. Last month also, Agarwal had invested in Zapr. Zapr was founded in February 2012 by Deepak Baid, Sandipan Mondal and Sajo Mathews. Baid is an IIT-Madras alumnus, and has earlier worked with Everest Group. Mondal has an engineering degree from Rensselaer Polytechnic Institute, New York, and was previously involved with Essex Lake Group. Mathews is an alumnus of IIT Kharagpur, and was with Feedback Ventures prior to founding the startup. All three founders are alumni of IIM-Ahmedabad as well. The Zapr technology enables users to connect the TV screen with the mobile screen, so that the viewer can be engaged across several mediums. 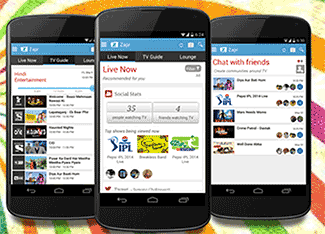 Zapr claims to have media consumption data repository which is 100 times larger than its counterparts in India. It also provides insights on the data to brands and broadcasters for advertising purposes. Earlier, the company's business model also involved providing reward points for watching TV commercials.